Big Bear Marina boat rentals and jet ski rental is the best choice for Big Bear Lake adventures. 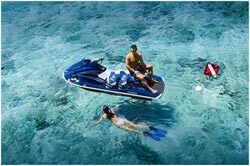 Choose from wakeboard boats that accommodate up to 18 people or ski boats. Enjoy water sport activities like wakesurfing, water skiing, wakeboarding, kneeboarding, flyboard, and air chair lessons all provided by Invert Sports. Waverunner rentals have quiet 4 stroke motors with great fuel consumption. Enjoy a scenic narrated tour on the beautiful Big Bear Lake guided boat, or go learn a new water sport from a professional instructor. Want more adventures? Big Bear Lake has PWC personal watercraft, sea doo, wake boarding, and water skiing with an experienced skipper captain to show you the right way. Conveniently located off Big Bear Lake, and walking distance from the village, and with on-site parking, Big Bear Marina Boat Rentals makes it easy for you to enjoy a day on the lake. Enjoy the fun of watercraft recreation rentals at these marinas, launch ramps, and resorts around Big Bear Lake; Fawn Harbor Marina, Lighthouse Trailer Resort and Marina, Big Bear Shores, Juniper Point, Pine Knot Landing, Big Bear Marina, Holloway's Marina, Pleasure Point Landing, Gray's Landing, North Shore Landing and more!